A work in progress since 1997. The descriptions here are not perfect; this is a work in progress. Remember, if what's on this list doesn't look like what's on-screen, go with what's on-screen. This list is NOT "definitive" and is intended as a convenience to people assembling costumes, not the word of God. If you think you notice a mistake or just want to chat about costuming, please email me. (If you see something that is wrong/incomplete, it would really help if you tell me which scene I can see the detail in question; I reply much faster if you send a photo/screencap than if I have to drag out the Blu-Ray.) I am happy to talk with anyone so long as a tone of mutual respect is maintained. Yes, the site is still regularly updated; for details, see "What's New" below. All mistakes on this list are my own--nothing goes onto the site until I have verified it with my own eyes. A note about the DVD: it really has changed everything. Now everyone can have access to high-quality stills. Same thing for the Blu-Ray but more so. If you want to do serious detail work, buy a copy. I bought a DVD player specifically to watch Rocky, then did the same thing for the Blu-Ray. Make sure you get a player with zoom capabilites. If you're looking for DVD software for your computer, I recommend PowerDVD; it has screen capture capabilities and frame advance. Several of my friends have also been happy with it. Blu-Ray capture is significantly more difficult and will probably require some creativity, or just popping the disc in every time you want to check something. This list is intended for fans who want to recreate the costumes from the movie "The Rocky Horror Picture Show." If you are costuming a production of the play "The Rocky Horror Show," I can't stop you from using this website for reference. But I can strongly encourage you to do what Sue Blane did and costume the play using your own original ideas, or, if you must, using her designs as a jumping-off point instead of slavishly copying them. Please leave that to us fans. If you want to know what costume pieces a character wears, go to that character's page. If you want to know how to make yourself up like a character (including tattoos), visit the Makeup by Character and Tips & Tricks page. If you are wondering how to find costume pieces or want general tips on making costumes or costume care, visit the Costume & Prop Tips & Tricks page. If you are looking for specific websites which sell shoes, gloves, etc. or want to find people who will make costumes for you, visit our Links page. If you don't see what you're looking for, or you think you've found a mistake or omission, by all means email me. Please do check out any details you write about before emailing me, though; if you haven't bothered to check the detail, why should I? Each section has a "last-updated" date on it--remember, if you print off a section, you do not have the most current version unless the dates match! Correctly-colored Columbia bustier fabric available! In 1999, Kim Shafer, faced with the impossibility of finding correctly-colored multisequin material, had a bolt MADE and offered it for sale to Rocky fans. It went in less than 2 months. Since then, Larry Viezel has periodically had additional bolts custom-made. Price is $50 a yard; custom is expensive. http://www.homeofhappiness.com/fabric has the details. The majority of these photos can be seen in the 2005 coffee table book "Mick Rock: Rocky Horror," which features over 300 photos. You can usually find the hardcover German/US edition used at amazon.de (Amazon.com's German branch) - it's gotten somewhat pricey since it went out of print, so it might be worth watching the Euro. A more affordable US paperback version was supposed to come out in 2006, but it never happened. If you're a serious costume freak, order it. Frank's dinner corset. In October 2000, my husband and I won Frank's dinner corset from the film at auction at the 25th anniversary. Many thanks to Jaimie Froemming and Mark Beck., who photographed it for us and who floated us a small loan. Rocky's trunks in gory detail and in color! : Some wonderful fans from South Carolina went and took a bunch of close-up pictures of Rocky's trunks at the Hard Rock Cafe in Myrtle Beach. (Thanks, Dawn!) The external link's been dead, so we're displaying some of them here, in addition to a few I shot. Keep in mind that Sue Blane says she thinks Rocky had several pairs (the gold wore off very quickly). But these photos are as close as we'll probably ever get to definitive. https://www.facebook.com/photo.php?fbid=1661176060560&set=o.160788907308875&type=3. Sadly, the way they're displayed (on a mannequin) means you can no longer see the inside of the shorts. Frank's floorshow shoe. A friend acquired it and asked if I'd like to take pictures. Here they are! Columbia's bustier. Larry Viezel acquired it and let a couple of us take pictures. Some of these were posted on rhpscostumes; here they are, with some additional photos to boot. Columbia's floor show boa. Larry Viezel acquired it and let a couple of us take pictures. Some of these were posted on rhpscostumes. Here they are at last. Janet's pink dress. 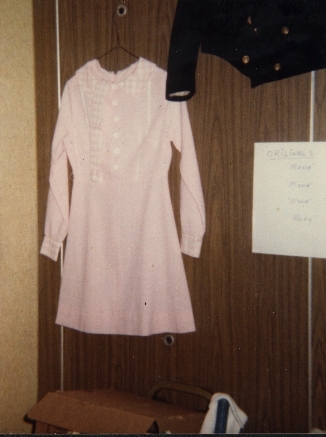 Megan Tabor provided this photo of the dress, which Sal Piro brought to an early Las Vegas convention. Wonder no longer if Janet's cuffs are gingham. NOT FROM THE FILM - Frank's red floorshow corset and the yellow sequin gauntlet. Also a platform shoe, a red sequin gauntlet and a fishnet gauntlet. At the same auction where my husband and I purchased Frank's dinner corset, we also purchased costumes from the original Broadway production at the Belasco: Frank's floorshow corset, fishnet and yellow sequin gauntlet, and underwear; as well as a red sequin floorshow gauntlet I was told was Brad's. At the same auction, someone else bought Frank's Belasco shoe; I have since acquired it from the original buyer. While these costumes weren't in the film, they look very similar (except for the shoe - shape is similar but it's just covered with glitter) and I presume they'll be of interest. Belasco shoe photos updated 7/4/12. I've just acquired (July 2, 2012) a boa, which I'm told was Columbia's, from the Kings Road incarnation of the original Rocky Horror Show in London. It's possible it was used in the film....but not for Columbia. NOT FROM THE FILM - Frank's undies, red corset, and Rocky's shorts. I still need to post photos of Magenta's chiffon dinner dress and her very battered apron. A friend acquired these. The Magenta costumes I haven't posted yet are actually probably more exciting, at least if you're a Magenta wondering how they fasten/stay on. Thoughts on wig and hair supplies, and basic wig care. Not the thoughts of an expert but might help.